The students are shown in the picture with the White House in the background. 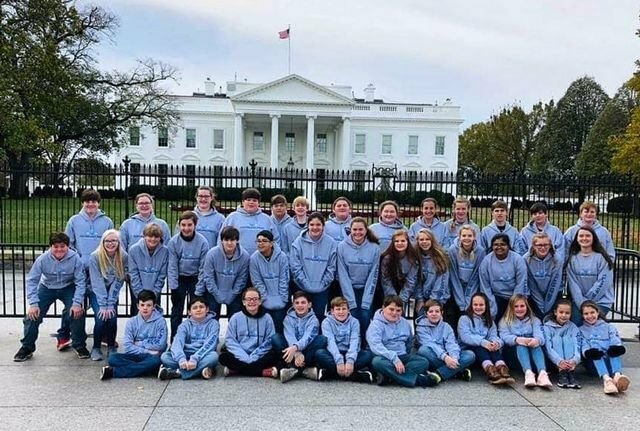 Southland Academy seventh graders recently toured the National Capital and surrounding area for five days. The students visited historical sites in Jamestown, Yorktown, Williamsburg, and Arlington, Virginia, as well as Washington, D.C. While in Washington, D.C., the students toured the U.S. Capitol, White House, Arlington National Cemetery, the Bureau of Engraving and Printing, Lincoln Memorial, Jefferson Memorial, the Marine Memorial, Smithsonian National Air and Space Museum, and the Pentagon. One of the highlights of the trip was playing in the snow on the last day in Washington, D.C., when over 10 inches of snow surprisingly fell overnight. Twelve adults, including Assistant Headmaster and Mrs. Clint Humphrey, Mrs. Genie Giles, Mr. Jody Hagerson, Mr. and Mrs. Sims Jones, Mrs. Pinky Patel, Mrs. Leigh Anne Saye, Dr. Sean Sheff, Mr. Jason Tarrer, Mrs. Jill Youngdale, and forty Southland seventh graders enjoyed this educational and adventurous trip directed and accompanied by Mrs. Susan Welch, Georgia and U.S. History Teacher at Southland Academy in Americus.